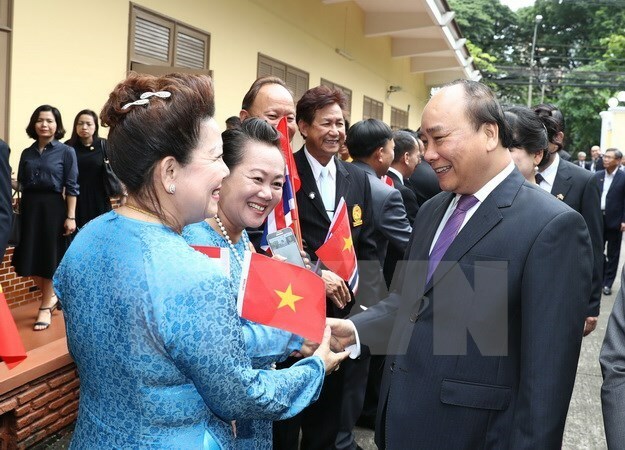 Bangkok (VNA) – Prime Minister Nguyen Xuan Phuc and his entourage arrived in Hanoi on August 19, concluding the first official visit to Thailand at the invitation of his Thai counterpart Prayut Chan-ocha. During talks, the two PMs vowed to lift bilateral trade to 20 billion USD before 2020 by helping each other become regional trade hub and encouraging Thai investment in tourism, support industry, finance-banking, science-technology, agro-fisheries. The two sides reaffirmed the significance of maintaining peace, security, stability and maritime safety and freedom in the East Sea. Concerned parties need to fully and effectively implement the Declaration on the Conduct of Parties in the East Sea (DOC); building, maintaining and improving mutual trust; respecting the principles of exercising self-restraint and banning use of force; and settling differences and disputes by peaceful means in line with international law, including 1982 United Nations Convention on the Law of the Sea (UNCLOS), they said. They reiterated their support for ASEAN and China to soon reach a Code of Conduct in the East Sea (COC). The Vietnamese PM, President of the Thai National Legislative Assembly Pornpetch Wichitcholchai, and President of the Thai Privy Council Prem Tinsulanonda hailed significant progresses in the framework of the 2014-2018 Action Plan to implement the Thailand – Vietnam strategic partnership, and agreed to continue fostering bilateral links. The two PMs also witnessed the signing of a cooperation agreement on science-technology and innovation between Vietnamese and Thai governments, memoranda of understanding on economy, trade, post and telecommunications and banking between ministries and agencies, and others between localities and businesses. PM Phuc attended the Vietnam – Thailand economic cooperation forum with Thai Deputy PM Prajin Juntong and more than 500 businesses from both countries taking part, during which, he witnessed the signing of a number of deals between Vietnamese and Thai businesses. During his stay, he also met with executives of leading Thai firms and attended a ceremony to launch the Vietnam Week in Thailand to promote Vietnamese goods in the country. In Nakhon Pathom province, the PM offered incense and flowers in tribute to late President Ho Chi Minh at a memorial complex dedicated to him, the largest one of its kind in Thailand.